We have also been made aware of a relatively new site called Pinterest. I would be interested to hear if anyone else has being using this. We only started on it last week but are finding it a very enjoyable way of categorising and storing interesting images of things we like or are interested in, be it for a specific project or just general interest. I have been collating images of great treehouses and the collection so far can be seen here. We have had a few guests who have had to move their bookings to later in the year. This means that at the time of writing we have one new place available on the May 10th-11th Bowl Carving Course and two new places on the April 23rd-27th ‘Make A Chair From A Tree’ course. Call – 01460 221 102 - if either of these dates suit before they get snapped up again! There are a few places still available on the other courses later in the year but do please act now as once they are full they are full. We will be doing some more filming here this year (more details as and when), and I’m also going to be doing some teaching for the Architectural Association at Hooke Park, so it is unlikely that we will be releasing any additional course dates over and above the ones already advertised. It really is a case of ‘book now for 2012’. There are many styles of coracle attributed to various geographical locations and the rivers they are used on. The design I've been working on with Adam is very much based on the version I studied with Peter Faulkener last year, when Peter was so generously passing on his skills and knowledge. Other variations, for instance, use ash laths instead of the woven coppiced willow and hazel we're using, and most makers for the last century have been using a calico and bitumescent paint 'skin', rather than the hide we're favouring. The calico version is a perfectly valid alternative and is obviously much easier to achieve. It also has the advantage of being lighter to carry when you're sneaking down to the river with your salmon net under the cover of darkness! I have to say though that, given the choice of end product, I am happier using the hide that has been drying on its stretcher for the last few weeks, It may take a bit more time and effort but the end result has a timeless quality that harks back to ancient times and craftsmen. It is exactly these ancient skills that are so valuable for us to understand, document and preserve for future generations, so that they aren't lost for ever - as so many crafts have or are being. The willow we use is from the withie beds that we planted at the Woodland Workshop just two years ago. Frankly, it is staggering how quickly the willow grows, producing a crop suitable for coracles every year. The hazel comes from an eight-year rotation coppice on The Forde Abbey estate next door. The harvesting of the coppice is a seasonal activity when the leaves have fallen; a very satisfying winter job. We both have a lot more to cut yet for this year's season - the perfect way to spend a crisp February day. Bending the hazel frame needs to be done with great care (if they snap they can be replaced but this is a tricky and frustrating process). 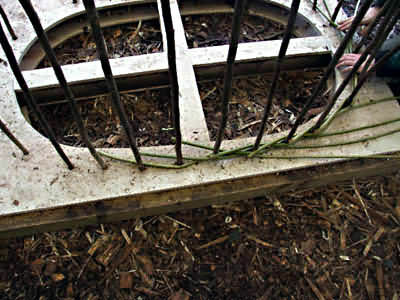 It involves pulling the hazel with one hand to tension the bend as the other hand teases it to shape. 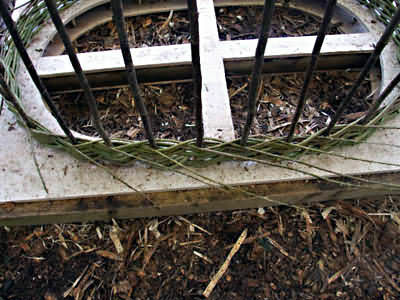 Many weavers would weigh the bent hazel down for a period of days or even weeks to achieve the all-important flat bottom. However, Peter Faulkener developed and taught me a very clever way of pulling the central run down with a Spanish lanyard prior to tying all of the marine twine knots. This in effect locks the lattice to shape and when the lanyards are unwound the whole structure stays the same shape - absolutely brilliant! Once the structure is complete it is just a matter of going around with some sharp secatuers to snip off any sharp ends that may puncture the hide, and then a quick going-over with oil on the frame and oak seat completes the process. The limed hide is then soaked to make it supple again and positioned over the frame, leaving a small gap at the back to drain any water out after use. It is then cut to shape around the gunwale and laced in place using more wet leather strips. Due to the shape it looks alarmingly baggy at this stage despite our best efforts to pull it tight. However, just a few days drying out and it's as tight as a drum with no more wrinkles to be seen. The oak bark tannery that's supplying us (the only one in England) is just up the road, and I'm off to get some more hide next week. We need to be ready to demonstrate this stretching and drying when we're in the Green Field at Glastonbury Festival this year and - of course - we need hides for our coracle making courses this season too. While I'm at the tanner I'll also be picking up some dubbin to seal and protect the outside. And after all that work on the coracle, there's the question of the paddle. This is made from ash and requires our regular traditional green woodworking techniques with the drawknife and spokeshave on the shaving horse - an oar is just a very big spatula after all! 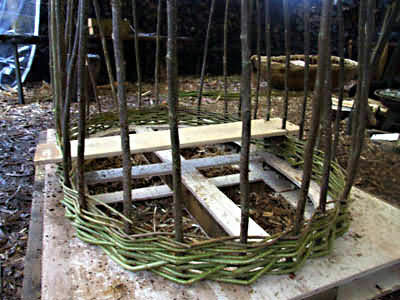 I am a woodworker and designer running green woodworking and craft courses in a woodland workshop in Dorset,UK. I am passionate about wood and craftsmanship in general. In-between running courses I take on commissions in green wood. HOLLY BERRY. I Design Therefore I am.